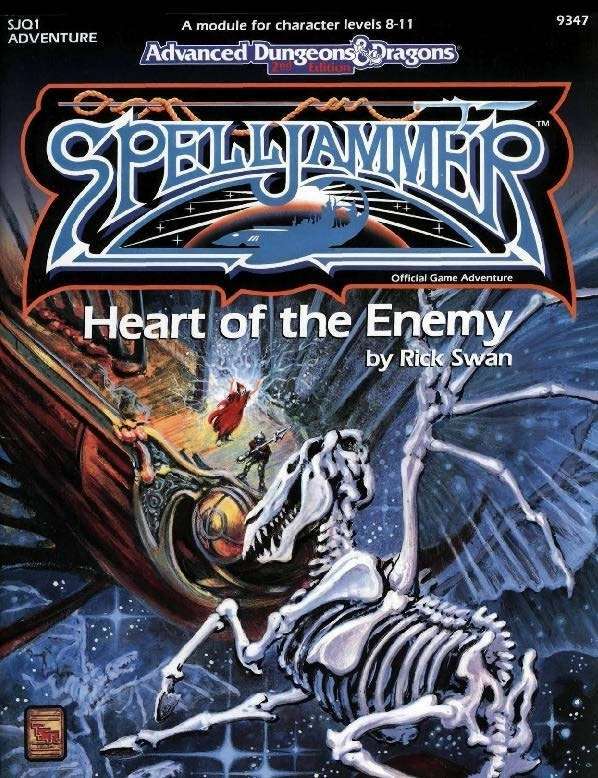 Examen de “Heart of the Enemy” en français! Shaundar let out a low whistle. Well, that would complicate things. Glyth was known to be a colony of illithids – squid-faced aliens who ate only brains – who kept humanoids of all sorts as “cattle” on the burnt out surface of the planet. They were also known to patrol local space to add to their collection, despite the efforts of the Navy to curtail this. Furthermore, the rings of Glyth were made up almost entirely of several small rocks and ice blocks, dangerous to navigate and often difficult to see. The blood started pounding through Shaundar’s veins. Was this going to be it at last? Sylria, Second Helmsman but Primary Navigator, saluted. “Av, quessir. I’ll head to the Chart Room now, sir, with your permission.” The Captain nodded and she climbed down the hatch. “Many of you have never seen combat before,” the Captain went on, fixing each of them with his kind but dark hazel eyes, which came to rest on Shaundar and Yathar. “If this turns out to be the opening gambit of the War in Realmspace, keep calm, do the jobs you have been trained to do, and trust your crewmates, and all will be well.” He smiled at them encouragingly. “Av, quessir!” they chorused. Eyes glittered and the smiles were jovial. They were ready to fight. “Mr. Yathar, you are also certified as a battlepoet, are you not?” the Captain inquired. Yathar beamed. “I’ll fetch my lute, sir!” Yvoleth nodded and Yathar went to do so. “Mr. Sunfall,” the Captain said. “Sir!” Shaundar replied, immediately at attention again. Regardless of subrace, orcish (and in fact most goblinkin races) society tends to take one of two distinct forms in wildspace: Independent tribes and organized nations. The independent tribes operate much as their groundling cousins, and in fact most truly are groundling tribes who somehow gained control of spelljamming vessels and migrated into space. These tribes still favor a single orcish deity as their patron, and the priests of that deity will dominate any other priests who reside with the tribe. Such tribes have few long term goals beyond increasing their territory, and subsist primarily on piracy and raiding. The organized nations are a very different story; they are composed of multiple tribes and have more complex governance. While some are formed due to the might of a single orc warlord, those rarely outlast the life of that individual, breaking up into their disparate tribes upon his death. Those nations with history backing them up are typically governed by a hereditary monarchy or a council of military leaders (the scro being a perfect example of the latter). Only rarely in these nations do the priesthood rise to leadership, although they almost never lack for political power. The tribes that make up these nations rarely have patron deities anymore (although their names may still reflect their former state), and priests of all deities can be found in relatively stable numbers throughout. Wildspace orcs are a clannish lot. Most orcs are part of small buccaneer clans that have much in common with traditional pirates. Rarely these clans will unite behind a powerful leader known as a “Wolf Chief”, a title that honors their cunning, battle prowess, and ferocity. Orc legends speak of a mystical homeworld, where all orc tribes began. Fortunately, perhaps, the name and location of this homeworld are long lost. According to the legends, this world has twisted badlands and deserts that the orcs scoured in search of elusive scorpion husks. Hundreds of scorpionships set sail from this homeworld.